The post hunter’s still-hunt paused near an old shelter site. He settled in next to a wild cherry tree and surveyed the flat-topped knoll. After a brief pause, the wing-bone call touched impatient lips. Two soft clucks wandered through the cedar grove… Old Northwest Territory, a quarter mile east of the River Raisin, in the Year of our Lord, 1792. 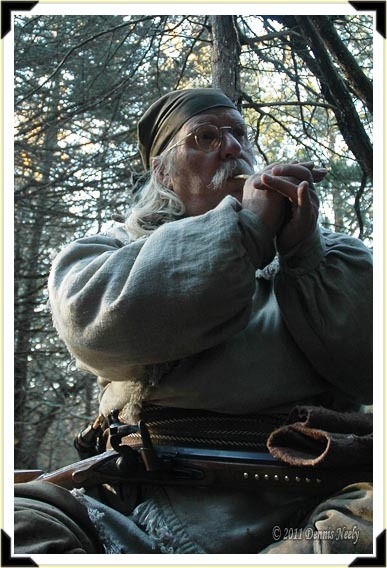 This entry was posted in Uncategorized and tagged Black powder hunting, Dennis Neely, North West trade gun, Northwest trade gun, trade gun, traditional black powder, traditional black powder hunting, traditional blackpowder, traditional blackpowder hunting, Traditional Woodsman. Bookmark the permalink.